The evolution of the toilet started the 26th century BC. They were first thought to be used in the Indus Valley Civilization. Fast forward to 1738, and meet J.F. Brondel who invented a valve type flush toilet. By 1857, the first American patent was granted for models that are similar to those used today. A lot has changed since 2600 BC, but the concept is the same. 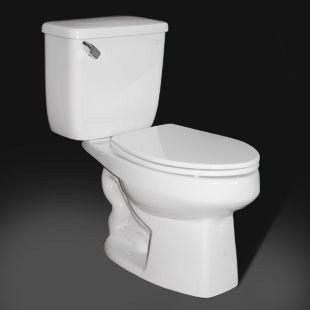 As our nation becomes more environmentally conscience, so is the movement of low flow high efficiency toilets. Since the 90′s, there has been a movement to use less water when flushing. In 1992, The United States Congress passed the Energy Policy Act of 1992. In response to this bill, manufacturers began to develop and produce low-flow toilets that use 1.6 gallons of water, compared to 3.4 gallons of water. There were many complaints across the board from consumers and plumbers alike. In response to those complaints they modified the passageways, thus improving efficiency and still reducing water usage. The average home plumbing system will work fine with today’s low-flow toilets. However, older homes with older plumbing might have issues with solid waste backup. The U.S. EPA calculates that replacing a single pre-1980 toilet with one measuring up to WaterSense standards can save an average family 18,000 gallons of water or $110 in utility costs. This cost can be carried through to your septic system and drain field. When you have less water flowing into your septic system it reduces the stress on the soil receiving the water. It is also important to only flush toilet paper or organic waste in toilets connected to a septic system. Homeowners should also be careful when choosing cleaning products. Choosing only those products that are non-abrasive and that will not break down the natural bacteria in the septic system. Consider baking soda or vinegar to clean with and protect those good bacteria of the septic system. A healthy septic system is one that works together with your plumbing to remove waste from your home. Low-flow systems certainly can help reduce waste water in your septic tank. Low flow systems can be very efficient with proper care. They can also save the homeowner a significant amount of money over time. Septic Zone offers preventative maintenance as part of their annual septic maintenance throughout the US. Call one of their experts today on (844) 440 8668 to learn how to properly maintain and care for your system. By catching potential problems early, one can save costly repairs in the future. A good example of homeownership is learning how to properly care for your system and maintain it. If you need septic system services call Septic Zone.